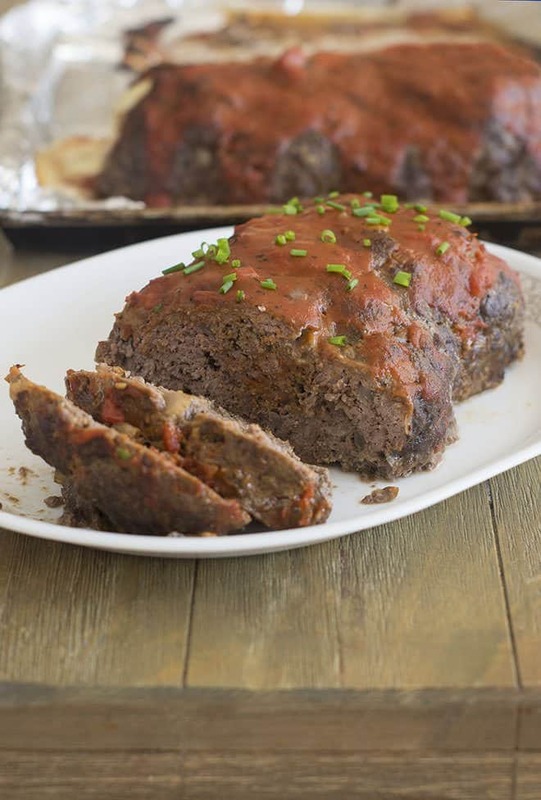 This meatloaf recipe is amazing – perfectly seasoned and guaranteed to slice easily. The tomato sauce glaze is delicious too! Meatloaf. It’s a weird word, I know. It doesn’t exactly sound appealing. But it’s so good, right? It’s one of those classic comfort foods that my mom made regularly and that I continue to make today. I’ve had challenges with meatloaf in the past. The first challenge is getting the right flavor. 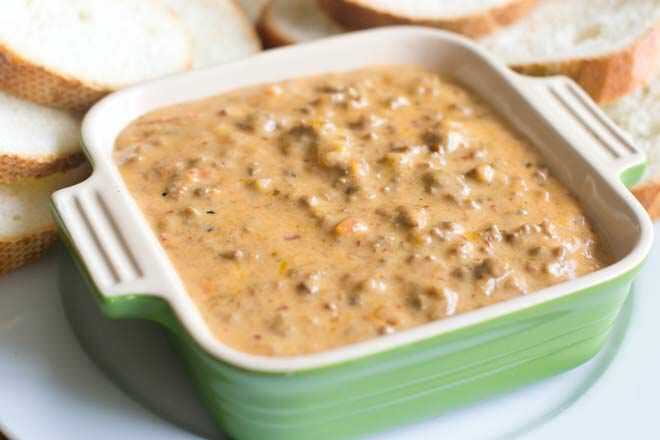 The ground beef needs to be seasoned well and you need a good sauce for on top. Those two things are key. 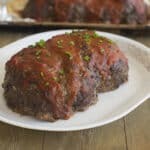 I actually found a meatloaf recipe on myrecipes.com that seemed promising. Lots of good reviews. It called for too many specific seasoning blends though: Italian breadcrumbs, Greek seasoning and Creole seasoning. That seemed like overkill to me. Mostly though, I just don’t ever have two out of three of those. That recipe also had too much Worcestershire sauce for my taste, in both the meat mixture and in the sauce. I therefore simplified the meat mixture’s seasonings and tweaked the tomato sauce. The result was seriously tasty. The tastiest meatloaf I’ve ever had, in fact. The great thing (beyond flavor) about this recipe is that the meatloaf really holds together and slices well. That is the other challenge that I tend to have with meatloaf, where I go to slice it and it crumbles. The key, I’ve learned, is to have a good amount of binder (like breadcrumbs) in the meat mixture, and some egg. Also, and this is crucial, let the meatloaf rest for awhile before trying to slice it. Wait at least 10 minutes. It will still be hot inside, don’t worry. 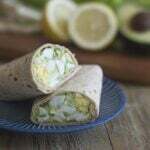 That resting time out of the heat lets everything calm down and settle together so that when you slice it, it holds itself together. 1. To test the seasoning in your meat mixture, do the microwave test. 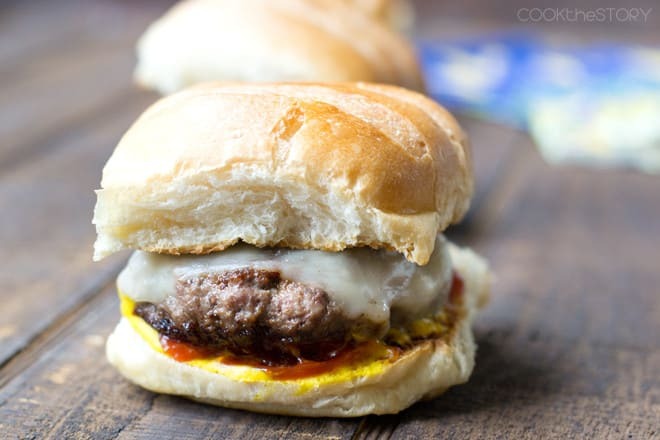 I first told you about this for my basic burger recipe. 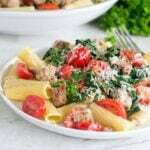 What you do is to take a bit of the meat mixture, about a tablespoon, and put it on a microwave-safe plate. Then microwave it until it’s no longer pink inside, 25-45 seconds. Let it cool a bit and then taste it. It’s not going to taste the same as a finished meatloaf. What you’re looking for is if there’s enough salt and other seasonings for your taste. 2. Don’t overmix the meat. 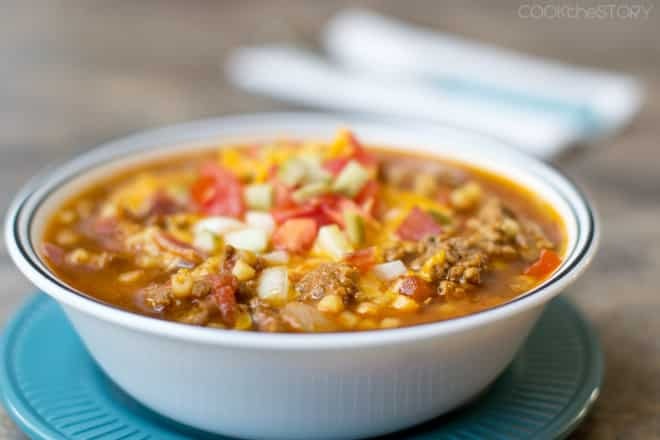 As with all recipes involving ground meat, overmixing will make the resulting product tough (like chewy, even. Not good at all). Put all the meat into a large bowl. Larger is better because you’ll have more room to move the meat and thus won’t have to handle it as much. Add your seasonings, egg, breadcrumbs, and any other ingredients that go into the meat. Then use your hands to knead and squish the meat until the seasonings seem to have been worked through. Err on the side of less mixing rather than more. 3. Use a foil-lined baking sheet. The ground beef oozes some liquid and fat that browns onto the pan. Clean up is way easier if your pan was lined to start with. 4. Make your glaze/sauce once you put the meatloaf into the oven. Then pour it over the meatloaf for the last 15 minutes of cooking time. By doing this, the meatloaf itself gets a nice dark brown crust, which we all know is super-flavorful. If you put the sauce on at the beginning, the meat under it would steam instead. Also, by adding the sauce at the end, it doesn’t dry out as much and is still nice and, well, saucy. 5. 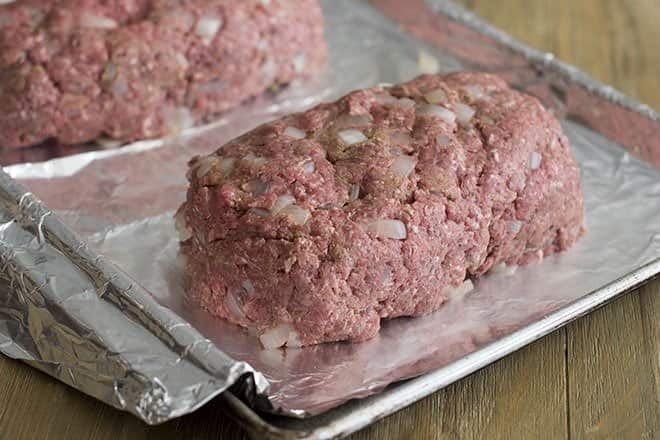 Use an instant-read thermometer inserted into the center of the meatloaf to check and see if it’s done. You don’t want to go through the whole process of making the meatloaf and cooking it only to cut into it and see red. Better be safe than sorry. 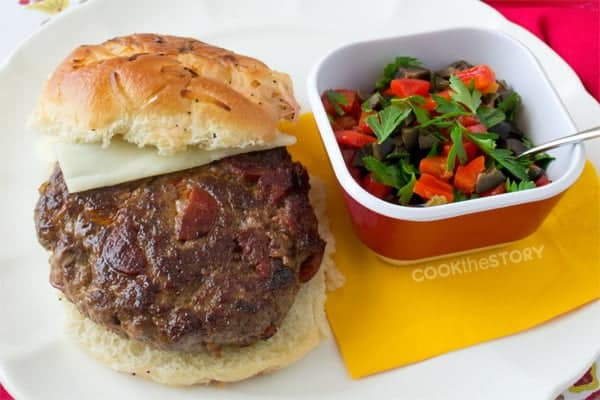 Ground beef needs to be at 160°F to be safe, according to foodsafety.gov. 6. I said this above but will say it again, let the meatloaf rest for 10-15 minutes before trying to slice it. That means, take it out of the oven and let it sit on its pan, uncovered. Just let it be for a little while. This makes it easier to slice. (FYI, I’ve given this advice before for other things that are tricky to slice, like lasagna. The resting time is key for slicing). 7. Use two large metal spatulas to get under the meatloaf and transfer it to a cutting board. You can slice it on the pan but it’s easier on a board. If you choose a nice board, you can even slice it at the table, or slice it and then take the board to the table as a serving dish. 8. Consider using an electric knife to cut the meatloaf. I find that I get more even, nicer slices from the electric knife, probably because I don’t have to see saw back and forth but can go straight down. There you have it. 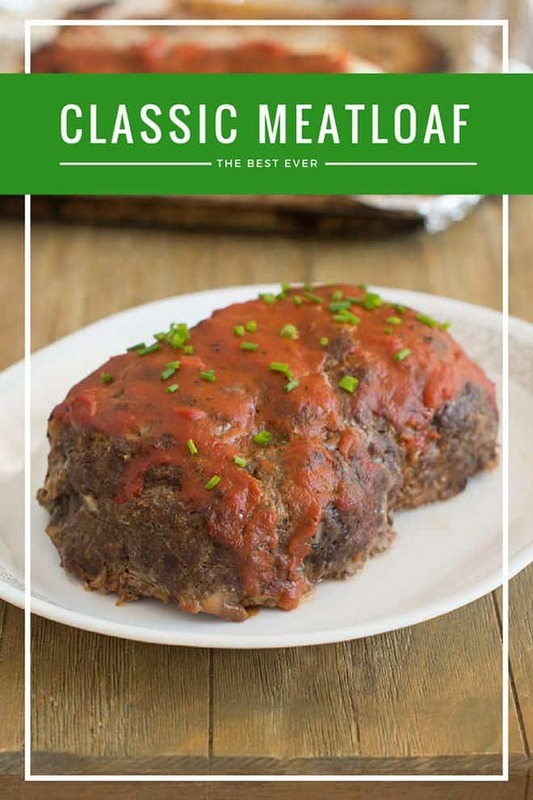 My tips for making the best meatloaf. 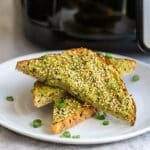 My recipe is below. Have a tasty day! Heat the oil in a medium skillet over medium heat. Add the onion and saute until softened, about 5 minutes. Transfer onion to a large bowl. To the bowl add ground beef, breadcrumbs, 2 tablespoons of the ketchup, Worcestershire sauce, Italian seasoning, garlic powder and egg. Use your hands to squeeze and knead the meat until the seasonings are all mixed through. Do not overmix. Transfer meat to baking sheet and shape into a 10x5inch loaf. Meanwhile, in a small bowl combine the tomato sauce, 1 tablespoon of ketchup, mustard and honey. Remove meatloaf from oven and spread with tomato sauce mixture. Return meatloaf to oven and bake until internal temperature on an instant read thermometer is 160F, 10-20 more minutes. Remove meatloaf from oven and let rest for 10-15 minutes. Disclosure: This post contains Amazon affiliate links meaning that if you click on one and buy something I will receive a small commission. This is at no additional charge to you. All opinions are my own.